As soon as you set foot in Percé, you will fall in love with this charming village. You will first be awed by the sight of Percé Rock and Bonaventure Island, just off the coast. You will then be swept up in the bustle of activities in the village, where boutiques, studios, restaurants and cafés beckon with their colourful facades and friendly staff. 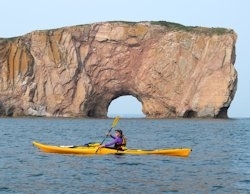 The Percé area is also ideal for hiking, bird watching, sea kayaking and many other outdoor activities. Visit the Percé UNESCO Global Geopark where you can admire a view of Percé from a glass platform suspended 200 metres (660 feet) above the ground. An excursion to Bonaventure Island is obviously a must: this is your chance to visit the most accessible northern gannet colony in the world! 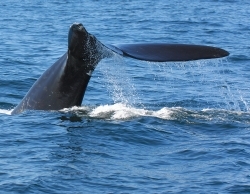 In addition, several different species of whales can be observed during sea excursions along the Gaspésie coast. 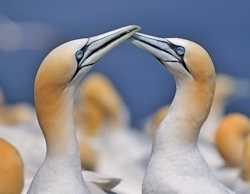 This park, which encompasses Bonaventure Island and Percé Rock, is the best place in the world to observe northern gannets. Get up close to over 110,000 birds—an outstanding bird-watching experience! Keep your eyes peeled: all summer long, blue whales, humpbacks, fin whales, minke whales, dolphins and porpoises can be seen in the waters off Percé! The Percé UNESCO Global Geopark offers 18 km (11 mi.) of trails, a glass platform suspended 200 metres (660 feet) above the ground, an interactive multimedia experience with Tektonik and an indoor playroom for children unlike any other in Québec! 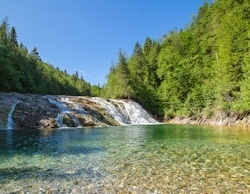 Explore over 50 km (30 mi.) of maintained trails of varying levels of difficulty. 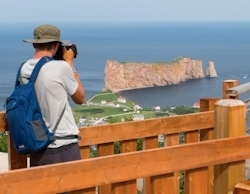 Easily accessible from the heart of Percé, they will take you through remarkable sites and offer breathtaking views. 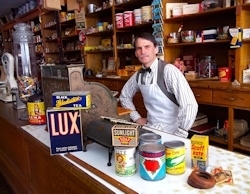 Enjoy the pleasant bustle of this authentic general store and meet characters who shaped the history of Gaspésie in large and small ways. For soft adventure enthusiasts, sea kayaking is a perfect way to appreciate the fragile and extraordinary beauty of Percé. [VIDEO] Percé: A Preview of Your Summer Vacation!